Nice work, but I hope the mock "Fantastic Four" cover doesn't get posted anywhere else out of context in a way that will confuse some as to where that image is actually from. Thanks for all the feedback Peter, appreciate it, and those are some great colors on your inked Thing, Oliver. As for the Fantastic Four logo, I placed it into the drawing just to see how it’d look as a cover, I’m not using it for any other purposes. I'm a bit worried about the use of the cover as well - I know you're using it to see how it looks, but posting to this site opens it up to some confusion. Dan, would you please remove it and replace with just your work? Thanks, Dan - much appreciated! Another really fun inking session. I really like that Oliver! Great job. Here's a little fun from me. Thanks Darren, but your inks are truly great. A feast for the eyes. Great job. Love it. Nice work, Darren. 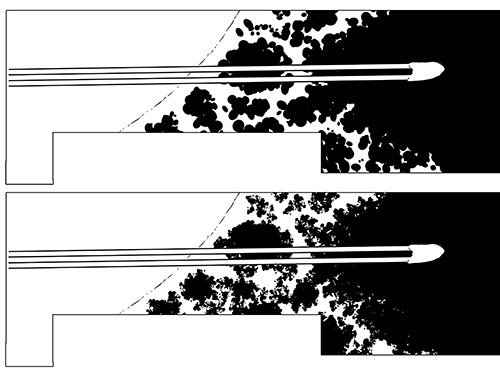 A lot of your feathering is getting destroyed by the dpi reduction, but we can see where you are going with the work. 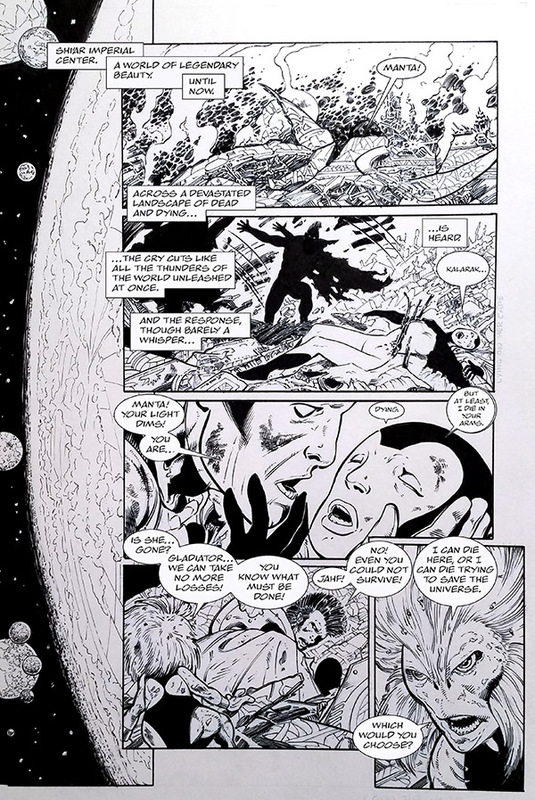 Lots of lines lost in this one with the image reduction, but still a good page to try to achieve that "zen" feeling. I made myself two PS-brushes for Kirby Krackle. One is my own design based on Kirby's effect and the other is based on John's Kirby-Krackle. It is too easy to find oneself 'placing' rather than affecting the Krackle. Having a brush apply the Krackle allows me the freedom to 'paint' in the negative space, as you would do with any other tool. Your Krackle is great, I just offer this as an alternative. edit-I should note that the total time taken for these two demonstrative panels was five minutes. One could spend a lot longer fine-tuning things and adding whit krackle to accent some areas. Nice one Mike. I enjoy seeing photo's which include the tools used. Darren, thanks for the brush suggestion. I do have Photoshop, but I am doing everything on the page. I need the practice. Mike, take a photo or scan of just the art and reduce it to 600 pixels wide. Can't make heads or tails of your picture. Here is my latest. Since JB added the lettering I thought it would be fun to add it to this page as well. What do you think? Here is just the panels if anyone cares to comment. Nice work from all involved! Makes me miss my days as a colorist! (I can no longer color since my stroke back in 2013) A real treat to see all this! That page is really stunning. 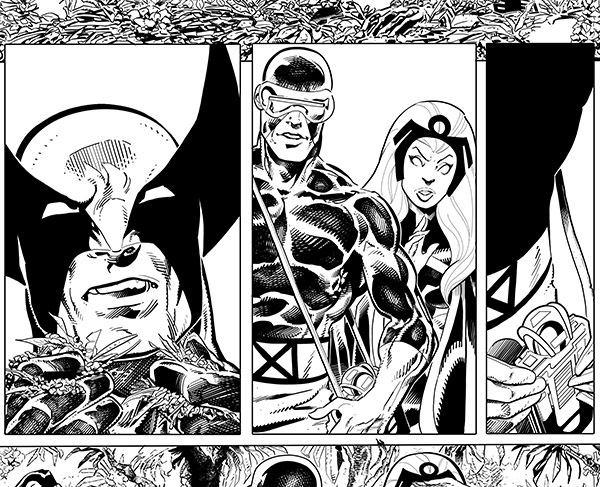 I realize our host had a little something to do with that, too, but you really did a wonderful job with the inks. Wow. I love your textures and your line weights. I messed up the lighting effect around the ship so this one goes on the "do over" pile. 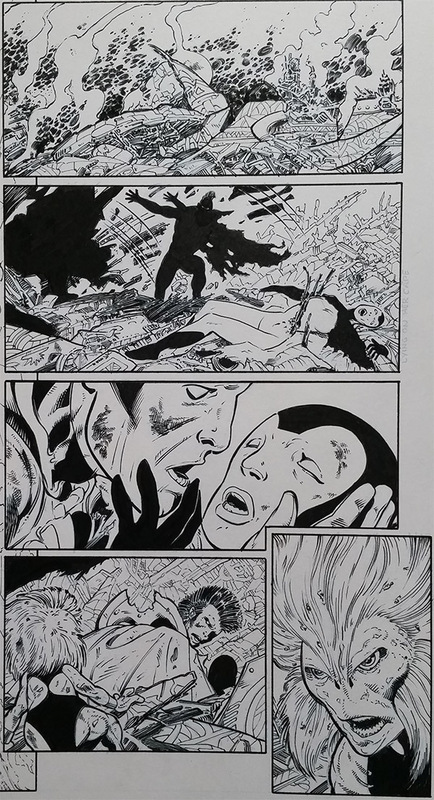 Mr. Ladd, your inking work is very respectful of JB's work, and very interesting. The raw material is of course exceptional. The whole thing makes me really dream (and sorry for my bad English). I've always loved John's jungle scenes. I got a kick out of inking this page. 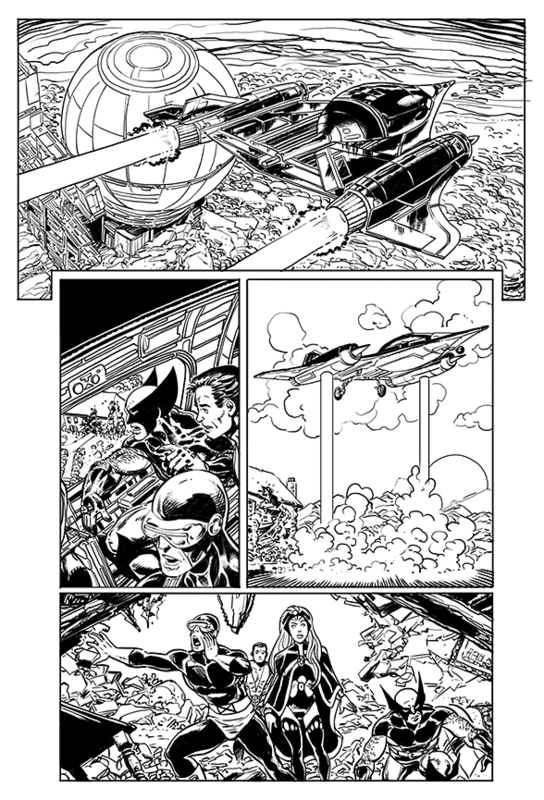 Every single panel space was filled with detail (quite a bit was lost with limited resolution for posting). Paul, you and I seem to be fairly consistent with postings so I wanted to give you my two cents. First, I recently picked up two new inking tools I want to suggest to you. Marvy Le Pen Drawing pens are fantastic! I've tried lots of different brands of pens from Rapidograph to Microns. I picked up the Le Pen Drawing pens and like them the most. You may have different tastes, but this is my go to "tech pen" for inking. I also picked up the hard and soft versions of Tombow Fudenosuke Brush Pens and like them for the same kind of work you might do with a crow quill. I still like brush and quill, but these additional tools might come in handy if you care to give them a try. First off, take everything with a grain of salt because 600 pixels wide reduces lots of detail and I'm also not a pro. I think your page looks good and there is lots of improvement month over month. I suggest you keep working on the line weights that define your figures. Panel one has a huge challenge to make Wolverine look like he is in front of Storm. The foliage in panel one at the top is nice. It is well defined, but as you move down the panel the foliage gets flat. JB drew lots of indications of plant life, but also suggested that his "argle bargle" needs to be interpreted by the inker. Make the plant life more definite. Panel two is better at showing depth with the foliage, but try to determine what is close and what is far away and use line weights to add more depth in that panel. No other panel has a longer field of depth on the page so you can make that panel stand out if the viewer's eye has the chance to travel "into" the panel. 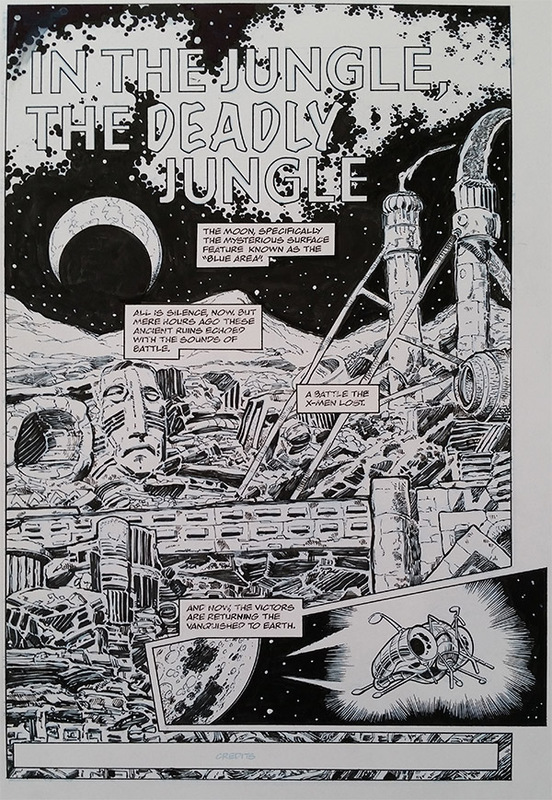 Panel three gives you some depth with the different line weights between Cyclops, the jungle and Sauron, but you need a different texture on the rocks and plants to trick the viewer into seeing the jungle. 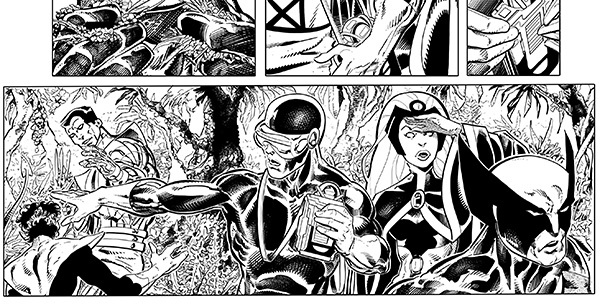 The feathering on Cyclops also will work better if you can get sharper points on those lines. Panels four and five seem like your strongest and I wonder if you worked down the page. Again, I suggest you go ahead and interpret the foliage in both panels. That will help separate the winged figure in panel five. 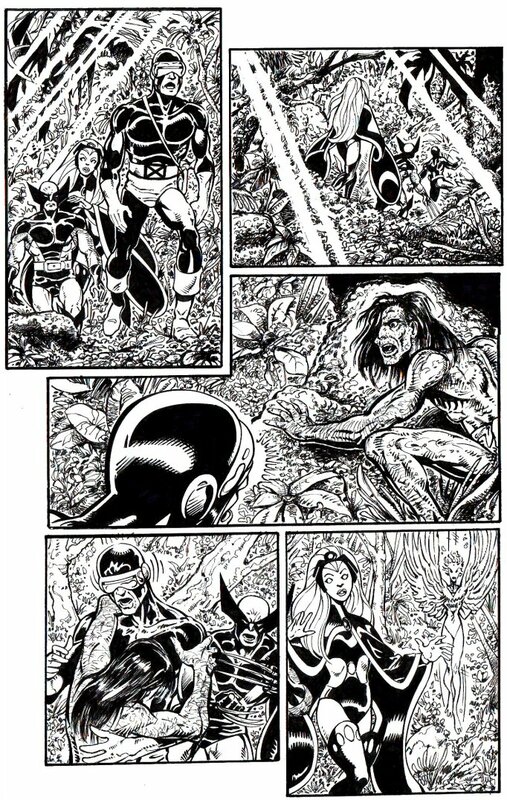 Take a look at how well Storm pops off the page in panel five because of the different directions and density of the lines for her hair surrounded by the foliage. I'm not trying to tear you down and see lots of good stuff here, but I think your frequency of posts to this thread means you don't need me to just tell you what I like. I'm looking forward to your next page! 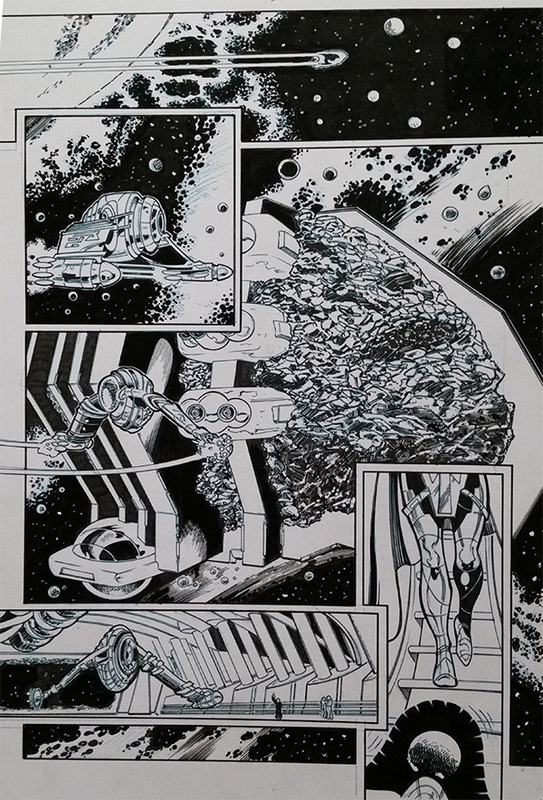 Thanks Eric - I appreciate you taking the time to give some perspective on my inked page. Very constructive and enlightening! 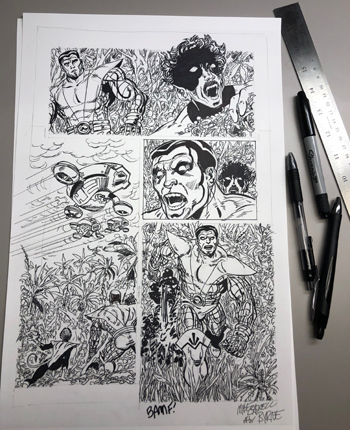 With inking (especially John Byrne's work) I hold off on straying from the pencil lines even though I know the penciller wants the inker to determine some of the layout - my problem is I don't want to offend the original artist by changing too much of their lines (but I know sometimes it's necessary - especially with background foliage). I'm going to pick out another page and give it a go. Thanks for the tip on the pens - I'll look them up! How are you guys transferring JB's scans to standard size Bristol board? I adjust the opacity of the overall file so the blue color isn't over powering. Also, as I get more confident with my inking I am able to reduce the opacity lower and lower. Right now I like 20%-25% opacity of the blue line file. Then I go to the local office supply, load some 300 series Strathmore Bristol board into their color printer and print away. Send me an email and I will send you the JPG files for a page as examples.